I also added a tiny bit (1/16 tsp) of active dry yeast to the bread, because I've been getting so much flack about flat bread. I was so pleased at how it had risen that I even tried slashing one of the loaves (while it was proofing, it had a little bird cookie cutter balanced on top - even before baking, it was impossible to see the bird design!) I just don’t know how you others do it. I admit it; my slashing technique stinks! It is less sour tasting. Even though the taste is pretty good, I'd still like to make a completely unsour wild yeast bread - without using even a trace of commercial yeast. Tomorrow when I feed the wild yeast, I plan to try bwraith's method of maintenance to see if that will lessen the sourness. Even though it has been decreed that this is one of my more successful attempts, I am still feeling defeated and just about ready to pack it in and toss the wild yeast out. It was devastating (well, maybe not "devastating"... perhaps "deflating" would be a better choice of word) to have to buy bread at Christmas time because my bread was so sour. Thank you for your encouragement, Anet. Thank you for your encouragement, Anet. I'm not quite ready to pack it in but the experiments will get farther and farther apart if I keep producing sour bread. I can eat it but my husband really doesn't care for sour bread. We only have so much room in our small freezer. Today, we are having stovetop dressing made from one of the overly sour loaves that were supposed to be served on Christmas Day. I just don't believe that sourdough has to be naturally sour! I don't even want to call it sourdough but want to consider the starter simply as a locally captured leavener. My goal is that our wildyeast starter will produce nutty tasting loaves rather than sour ones. Malt will also effect the enzyme activity in the bread as long as it is diastatic. Non-diastatic malt will only effect the sweetness of it. Sourdough doesn't need to be real sour. I would suggest increasing the temperature at which the starter ferments, and this will also change the time required before the next feed. Also, the wheat has natural sugars in it that are awaiting to be actualized by fermentation management. It would be a shame to utilize external sugars instead of bringing out the character of the grain. I agree completely, breadslinger. The only reason I added the malt was to counteract the sour flavour and push the rising of the yeast to give it actual sugar rather than having to convert the flour sugars. The only way that I can change the temperature that the starter ferments is artificially or by waiting til spring. I know that lots of others have managed to make non-sour naturally leavened bread in cooler temperatures and I'm determined that I can do that too, using a different feeding ratio. It is most definitely possible to make un-sour wild yeast bread! Just think of all that lovely french levain bread; not sour at all. Believe me, I know exactly what you're experiencing; I went through a spate of inedibly sour pancakes for months. The thing that turned it around for me was converting to a firm starter (look for zolablue's thread on that if you're interested), though lots of folks here do fine with more liquid type starters. The other big help was a posting by mariana about Calvel's 100% french sourdough. I don't know that there's anything magic about that recipe, it just seems to work for me, and has become the basis for most sourdoughs that I make now. You should definitely follow bwraith's instructions, they really do help a hugely! And remember, there's nothing wrong with a little commercial yeast spike. Frankly, at this time of year it's hard to do without if your kitchen sits at 50-60 degrees most of the time! Thank you for the encouragement, edh. > Just think of all that lovely french levain bread; not sour at all. That's what has been keeping me going! I just can't believe that people were eating insanely sour bread for all those decades (centuries?) before commercial yeast was available. I've changed the ratios with feeding my wild yeast as per bwraith's advice - unfortunately, I won't be able to do any baking with it for a week or so but am happy to say that I haven't completely lost heart on this. wild yeast from different areas with give wildly different flavors (sorry for the pun - couldn't help it). Also, bacteria are what make the sour flavors, not yeast (at least usually). So to get wild yeast loaves without sourness, you have to get the yeast without any bacteria and hope your area has good tasting yeast floating around. When you say you added malt powder, was it malted barley flour (diastatic) or dried malt extract? Because Canadian packaging laws (as far as I know) require that all ingredients be listed on food, this indicates to me that it is just malt rather than "malt powder" like Horlick's (wheat flour, non-diastatic malt flour, and powdered milk). edit: I see that King Arthur sells non-diastic malt powder saying that it is the main ingredient in New York bagels. Now I'm confused. Do I want diastic or non-diastic and what's the difference? malt Notes: This mild sweetener is sold as a syrup or powder. Diastatis malt is used by bread makers to feed the yeast and improve the texture. Nondiastatic malt is used in bread as a flavoring and preservative. That doesn't exactly answer my question but I'm now guessing that the malt powder I have is "non diastic" - I initially bought it for bagel making. Malt powder is probably diastatic and won't add much sweetness unless you let it sit in the dough quite a while. Malt extract is made by letting malted grain sit in hot water for an hour, the sugary liquid is separated from the solids and then freeze dried and sprayed into a power. Diastatic malt powder has enzymes to convert the grain starches into sugar, but unless you heat the mixture to 145-165 F (which would kill yeast), it'll take a very long time. Malt extract is just the sugars after all the starch is converted. Does diastatic malt powder taste sweet? Thank you for your reply, HogieWan. Does diastatic malt powder taste sweet? And if it gets dampened, is it a bit sticky? it shouldn't taste sweet, but if yours is sweet ans sticky, it sounds like malt extract. 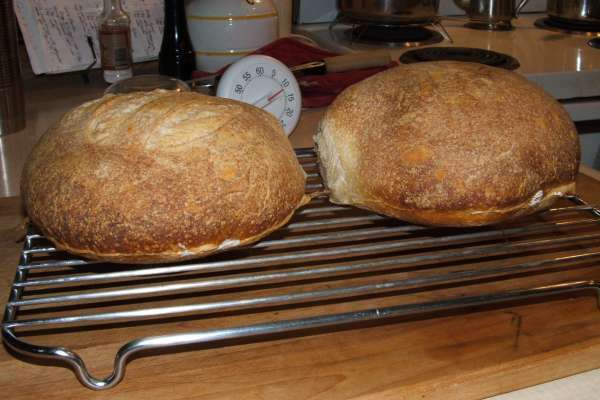 It is definitely possible to make natural yeast bread which isn't sour. 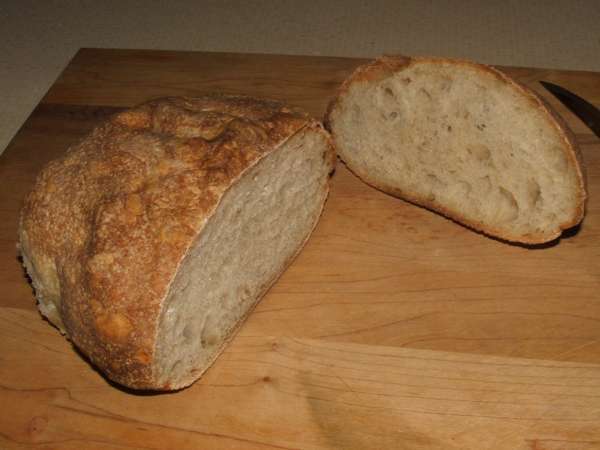 Adding sweetners like malt will create sweet and sour bread, not un-sour bread. You need to change how long you ferment and proof your dough. Increase the percentage of starter you use at each stage, and ferment/proof for shorter time. A bread with 33% starter will rise faster and be less sour than the same dough made of 14% starter. Also, use the starter at its "peak", not longer. After starter peaks it turns more and more sour. Yes, I know that. I was wanting to make bread that day though and decided to use a little malt. It actually worked (or perhaps the starter wasn't as sour as it had been previously) because the bread passed one of the primary critic's judgements. It didn't pass my judgement though and I am just now about to see if I can go ahead and shape dough formed with the new version of the starter made using bwraith's feeding recommendations. Since you posted this message in 2008, chances are you won't receive my post to you. hydration. So, my question, why? Why are you not in the 60 something hydration? is why I am trying your recipe--without the malt! Can you shed light on the low hydration matter? When I calculate the hydration from Elizabeth's formula, it works out to 76%. I have assumed 125g/cup of flour, or 3.5 * 125 = 437g. Water, at 1g/ml, is 335g. So, 335 / 437 = 0.76, or 76%. The true number may be somewhat different, since I don't know how Elizabeth measures her flour. Still, I very much doubt that it could be below 50%. It would be nearly impossible to bring the dough together if it is that dry. Thank you for replying. Now I know who you are, meaning, I have read a goodly number of your excellent posts. Please don't think me obstinate. I have some difficulty with your reply to me. The "wild bread with malt" post is given in grams. the preferment, that is less than 40% hydration. With the preferment it is just under 50%. That said, I made it and baked it. Good grief, I clicked on "Insert/Edit Immage," I can't figure out how to get my picture in this post. Anyway, good flavor, however, not the slightest hint of sour--which is what I wanted. I will try again at a higher hydration. The formula that Elizabeth followed was in volumetric units: cups and milliliters. It appears that you may be assuming that milliliters and grams are equivalent. That works for water but not for other materials. Picture a ml of helium at one end of the spectrum and a ml of lead at the other end, if that helps; same volume, radically different masses. If that is what you have done, it's easy to see how you arrived at your conclusion. When you convert the volumetric quantities to mass equivalents, grams in this case, then the calculated hydration level is significantly higher. I assumed a mass of 125g per cup of flour. That's purely a guess, based on how I measure flour. Elizabeth may measure hers differently. If, for instance, her cup of flour contains 140g, then the hydration level will be closer to 68%. Without worrying too much about the precise number, the formula should yield a fairly soft dough that probably is somewhat tacky to the touch after kneading. Based on your description, it seems you got that result. Good for you! Keep on baking and experimenting. I believe you are right, and Paul confirms so, to increase hydration when you rebake. Please check out Paul's calculation/conversions - I also believe he is correct - regarding cups to gm, as the original recipe does appear to have the flour stated in ml rather than gm and this seems a likely cause of confusion. I much prefer to express everything in weight terms only, as a gm is a gm world wide and can not be confused as can the various (Actually gets a mention in the original recipe) cup sizes around different countries/continents. Of course I respect anyone's right to make/bake/display their own personal recipes any way that suites them, but it sure does not make it easy for others in far flung parts to always interpret them correctly. Thank you, good enough. I made another batch at 67% hydration--nice oven spring and flavor--for one loaf. The other loaf went into the refrigerator. I realize, you have been doing this for a long time, you already know what you are doing. I read, here at tfl and elsewhere: "retard for sourness," and, cold retarding does not increase sourness. Good grief! Well, a fellow home baker manages to get some decent sour by retarding!?!? I have retarded for 36 hours--nothing, no sourness at all! However, it recently occured to me that when I retard, my yeast is still very active. That being the case, maybe nothing left for the bacteria that causes sourness. So, I checked my refrigerator temperature, 44F. I turned it down to 34F. I placed that second loaf into the colder environment, 36 hours later--EURIKA!!! A nice medium sourness to the loaf! I believe I am on the way to obtaining a decent sour, sourdough loaf--when I want it, not sour when I do not want it. oops, I'm here a little late... Thank you Paul and Brian for jumping in. Harry, when I made that sourdough, I was indeed measuring with cups. I didn't have a reliable scale. (I now own a digital scale) When I measure with cups, a halfcup of flour is roughly 70 gm. With roughly 490 gm flour and 335gm water, the hydration was around 68%. I must say that I am extremely envious of you wanting your bread to be more sour. Every time I have attempted to make bread using wild yeast, I have created The Most Sour loaves. Horribly sour. Since getting a digital scale, I have tried measuring by weight to see if it would improve matters. Feed the starter every 3 days: Take 2 Tbsp (30gm) of the refrigerated mixture – discard the extra (or add it to muffins or batter or…) – and stir in 2 Tbsp (30gm) water and 3 Tbsp (30gm) unbleached all-purpose flour. To use the refrigerated starter for baking, begin at the step for penultimate baking day morning. Alas, no, weighing the ingredients didn't work. The frustration was so great that I ended up accidentally on purpose murdering my starter. This summer, I lost my mind and decided to try again using a different formula. The grizzly account of the second attempt is here: blog from OUR kitchen | a second attempt at Tartine Bread (this is a link).